Custom Sheds Washington: Summertime Fun Awaits! At Better Built Barns, we love seeing the look on a customer’s face when their custom shed is finished and ready to use. No matter what the new building is for, whether it be storage or a she shed, there’s something to be said about finally having the space you’ve been wanting for a long time. With our shed options, any Washington homeowner can find the perfect building for their backyard or acreage. Your shed will get used throughout the year, but perhaps not more so than in the summer. You can keep your gardening tools and supplies in there, or you can turn it into a playhouse for the kids. Whatever you choose, you’ll know you have the perfect space for summertime fun! One of the best things to do during the summer, especially when the sun is shining, is to have a water gun fight in the backyard. 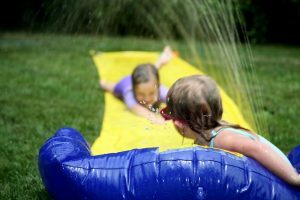 You can also turn on the sprinkler and break out the inflatable ground slide for the kids to use, and everyone can cool down with cold, refreshing water. However, once you’re done with everything, where do you store it? Stashing it in the garage is an option, but with a new shed, you can have a dedicated space for all of your water guns and backyard toys. You can even build a storage rack that lets you hang up all of the water guns based on size and shape! When the weather is nice, you want the kids to be outside, enjoying the sunshine. However, if it gets too hot, they’ll often retreat back inside to the cool comfort of the living room or their bedrooms. This is fine, until they get bored and begin bugging you for things to do. They don’t necessarily want to do chores, and having somewhere for them to go can keep them out of your hair while you’re trying to get things done around the house. A backyard shed can be the perfect kids retreat, and you can add fans or a wall AC unit to keep the space nice and cool. You can outfit the space with toys, games, and furniture, and the kids can have their very own clubhouse. You’ll know where they are, and mom or dad will be within earshot, should the kids need something. You may have plans for yourself this summer, while the kids are off at camp or staying with relatives for a few weeks. You built the shed to serve as a man cave or a she shed, and your plan is to take up a new hobby over the summer. You might want to start painting, or you might be building models of classic cars. Whatever the case may be, having somewhere that you can go that’s quiet and somewhat secluded can help you focus on your new hobby. Your custom shed can be designed with the features you want, including partition walls, a workbench, and more. Our team can help you choose the ideal options for your new building, and once the site is ready, we’ll have your shed up in no time at all. We have various shapes and sizes to choose from, so contact us today to see what we have to offer. You can call our Lakewood, WA location at (253) 537-3144, or you can use the form below and a member of our team will respond as soon as possible. 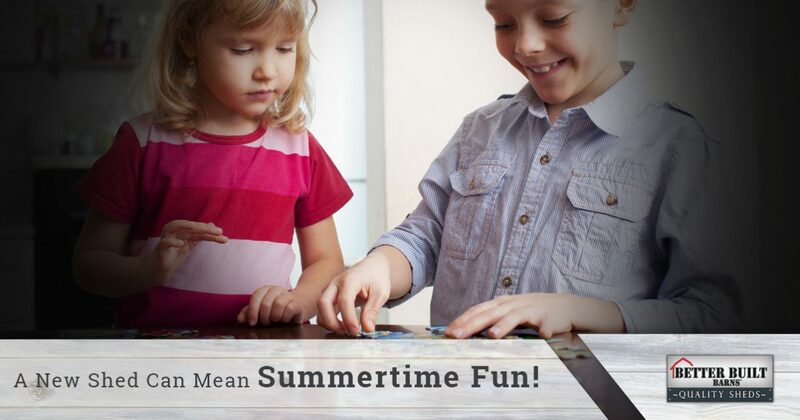 Don’t let this summer go by without having a little fun. Contact Better Built Barns today to get started on your new backyard shed!